On a warm summer night, bat experts from the Toronto Zoo join the Nature Conservancy of Canada’s (NCC’s) stewardship team among the towering trees of Happy Valley Forest. Although a mere 60 kilometres from the heart of downtown Toronto, in King City, the only sounds in this protected oasis of soon-to-be old-growth forest are the sweet soprano of evening birds and the steady hum of the orchestra of insects. Toby Thorne, Toronto Zoo bat researcher, and Jenna Siu, NCC’s coordinator of conservation biology for the Happy Valley Forest, work to erect fine mist nets across a stretch of the forest on NCC’s Goldie Feldman Nature Reserve. This is the second bat-catching expedition of the season. Toby is determined to net something more than insects this time around. As the light fades, the only winged visitors are the darting swallows and swarms of whining mosquitos. It is not until the stars and fireflies come out that Toby begins to pick up bat activity on his acoustic device. This small hand-held monitor can pick up echolocation calls that human ears cannot detect. He listens carefully. The static clicking noise the monitor produces can indicate different species, depending on the peak frequency it is tuned to. Toby is hoping to hear evidence of the little brown myotis — a species that is endangered in Ontario. Throughout the sultry evening, Toby, Jenna and their teams venture into the forest to check the mist net. It is only several hours later that they finally untangle a small, struggling fur ball from the netting. The bat struggles, her mouth open in a warning cry that only other bats can hear. Armed with protective gloves and a headlamp, Toby, a trained bat professional, carefully removes the wriggling mammal from the net. He temporarily places the bat in a cotton bag and brings her over to his gear. 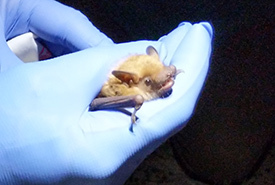 He weighs the bat — a big, brown female — and assesses health, age and other important data. Bats can carry certain diseases, including rabies, so Toby is very careful. He wants to cause the bat as little distress as possible, so he is also quick and efficient. As soon as he writes down all his data, he releases the bat back to resume its evening hunt. Toby only catches three bats that night — all big browns. While happy to see that the common species is using the area, he is a bit disappointed. He was hoping to catch a little brown — the species that NCC and the Toronto Zoo teams have been hearing all summer long on the acoustic monitoring devices strung up throughout the Happy Valley and Pottageville Swamp natural area. It’s all part of a larger bat monitoring partnership between NCC and the Toronto Zoo. Throughout the past summer, bat power couple Jenna and Toby have been recording the echolocation calls of bats on and around NCC’s conservation lands in the Happy Valley Forest. With the season over and the monitoring equipment stored for the winter, it’s Toby’s job to analyze both the acoustic data and the capture data from the summer monitoring season. And so far the results look promising. “The acoustic recorders show a strong indication that we have endangered little brown bats in the Happy Valley and Pottageville area,” says Toby. In fact, one of the recorders shows the second largest amount of calls from the species this season throughout the Greater Toronto Area (GTA). While the bat catching expeditions may not have yielded many results, the acoustic monitors have. “From the acoustic devices, which record bat activity throughout the summer, we can break down the data and see when in the season the bats are active and at what time of night,” says Toby. Calls that take place early in the evening imply that a bat maybe roosting nearby. This information can then be compared to other data collected throughout the GTA. “The monitoring from Happy Valley adds to the bigger picture we have of bats from around the city and southern Ontario,” says Toby. The recorders can even tell us something about migratory species, such as hoary bat, silver bat and eastern red bat. By studying the data collected at Happy Valley and other sites nearby, Toby and his team can start to understand migration patterns for these visiting winged mammals. Jenna is grateful for this research partnership. Learning more about the species that live in Happy Valley helps her and NCC in their work. “This research reaffirms why Happy Valley is such an important place to protect,” she says. The Toronto Zoo has been working on building their bat monitoring program over the last few years. Toby says that partnerships with conservation groups like NCC, Toronto and Region Conservation Authority and Parks Canada are key to their program. It is a symbiotic relationship; the conservation organizations have the land and the zoo has the expertise, equipment and manpower to help find the bats. Through these partnerships, the Toronto Zoo has been able to provide a more holistic picture of bat populations across the GTA. With the growing threats of habitat loss, climate change and white-nose syndrome (WNS), bat populations are on the decline, especially the endangered little brown myotis. Because of a lack of historical data, it is hard to know just how much populations have declined. But there is some good news. Toby and his team have found evidence of breeding little brown and northern myotis bats in the city of Toronto. While this is a positive sign, Toby stresses that more work needs to be done. Toby will be producing a report on the 2018 season’s findings this winter, but he is hardly done. He hopes to return to Happy Valley next summer and maybe even catch that elusive little brown bat. To learn more about the Toronto Zoo’s bat program, visit their Native Bat Conservation Program. Want to get involved and share your bat sightings? You can join the Neighbourhood Bat Watch Program.